When I moved to Missouri this fall, I thought I’d get the chance to hit the roads on the weekend. See some new areas that I’ve never seen, catch up with some of my friends that live in the Midwest. Sadly, with the move, work, etc., I am well behind schedule but I hope to find time this spring and summer to get some trips in. And I’m thinking if I take time to schedule them, they have a greater likelihood of being made! 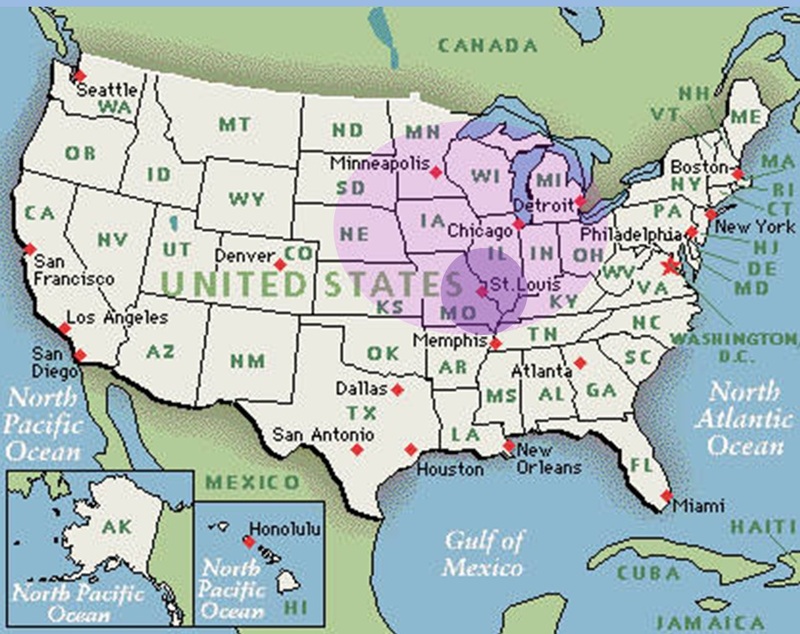 Well, I need to get to busy figuring out where I would go and who all I can see while I’m roaming around the Midwest! I need Midwest adventures! Rather than start out by inviting myself to visit various people, I’d at least like to give some of you a chance to invite me. Maybe it would help me find volunteers if you knew what sort of travel am I thinking about. Budget smart — I’ll have to budget both time a money reasonably well. That means I’ll be prioritizing visiting those friends who may have room for me (yep, that dear friend outside of KC who chases her cat from the guest room, may want to get ready for a short visit). Fun catching up — Whether its friends from back in the day at Phillips University or getting to know people beyond their tweets, I have to tell you good friends come first! Unique experiences & sights — Since I’ve not lived in this part of the country, my guess is unique experiences for me are probably the mundane for many of the peeps I’d like to go see. In fact, Flat Stanley had lots of fun I’ve never gotten to experience! Non-stop flights — With the expansion of non-stop flights by Southwest, I think I could probably pull off a couple of flights as long as I’m able to plan ahead. It seems there are quite a few places I could get to quickly. Some of the places that are possible are Omaha,, NE; Minneapolis, MN; Milwaukee, WI; and Columbus, OH which may give me a couple of extended weekends where I could cruise out from that location. I’ve already been hitting a few of my friends up for invites to their hometowns…. I guess I’ll have to see if they volunteer to host me a day or two or whether I have to hound them. LOL! Anyway, to make it easy for people to invite me (and to save my ego if nobody does) I thought a short form may help me keep this organized and then I can start figuring out a couple of trips! When do you think a trip is best? Willing to put up with me? I filled out a bunch of information and I am unsure if my computer sent it or deleted it. Can you tell me? Submitted an invite but it is for this month not spring/summer. February & March are pretty busy work wise but I’ll say maybe! Put it tentative on the calendar for a day trip! Got a new planter with new gadgets. Can’t wait to put it to work…………..
Heck, that even sounds like I could potentially make that a “work trip.” Love that! We have an award winning winery in town if that helps. That CERTAINLY works in your favor!!!! Ooooh…. Indiana just keeps sounding better! Thanks! I love the idea of the rabbit conference…. will have to see what I can work out! Ok so I wasn’t very specific in my offer because well…. It’s Wisconsin… We have beer and cheese and places that make beer and cheese and really. what more do you want? I can vouch for good company and lots of beautiful barn to take pictures of in Wisconsin, too. Definitely got all those on my last trip, although I forgot to buy more spotted cow. Well aren’t you the supportive voice! LOVE IT! Thanks for the ideas in your neck of the woods too! Did you see the form on the blog? I’m taking dates & all sorts of suggestions! Amazing how many folks are willing to help me see their hometowns! Yes and I filled it out the other morning. Did it not go through? You sent some AWESOME IDEAS! I feel certain we will be knocking around your hometown in the coming months! I sent my ideas, hope you can come. Thanks Michael! You gave me some great ideas! None of them are a surprise. Thanks, surprises or not, with so many ideas, capturing them is a great start! With you and Nate both making a sell, I bet I find a chance to hop a cheap flight to Chicago!